Deep in the forest there is a massive waterfall, and even more impressive, two massive size skeletons. One human skeleton like and the other a serpent, biting the neck of the giant and coiling around it. Locals say the giant is their god who created the world and man, one day the evil serpent tried to overthrow the god. Both fought until they ended up killing each other. To be closer to their god, who they believe protects them from evil, they have hollowed out the ribs and vertebrae of the giant's skeleton and built their village inside it. The skeleton is so large thousands of families live in it. 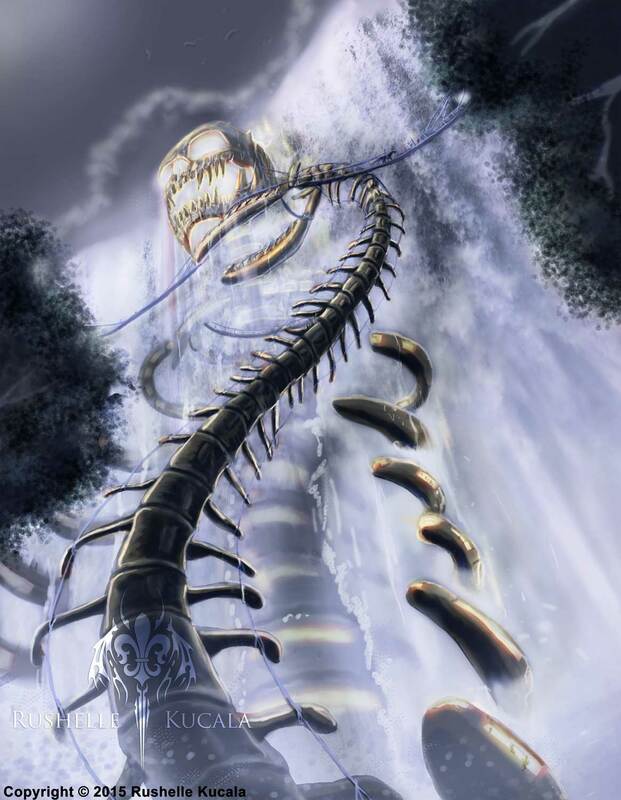 No one lives in the snake for fear of its evil, but they use it's body as a sort of stairway to easily travel up and down the colossal skeleton. At night the skeleton looks like it burns with life due to all the homes being lit from the inside and torches decorated throughout the skeletons.